Black soybeans are an incredible food that can help keep your bones, joints, bladder, reproductive organs and kidneys strong as well as help with lung issues such as asthma and coughs. This dish is simple and beautiful. 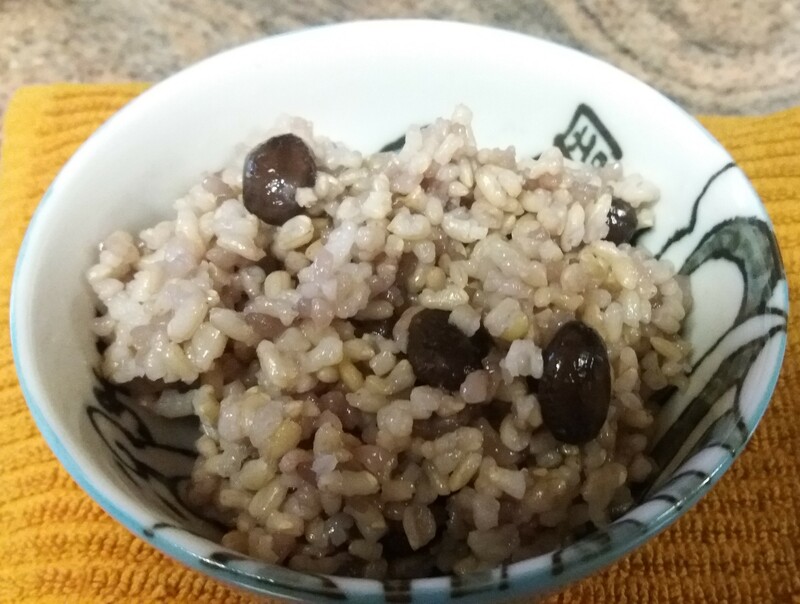 Combine brown rice, sweet rice and black soybeans in a large bowl. Add water and cover with a sushi mat. Soak 3-5 hours or overnight. Place grain and beans in a pressure cooker and bring up to boil. Skim any foam that may appear, add a postage-stamp-sized piece of kombu, cover and bring up to pressure on medium-high flame. When pressure is up, place a flame deflector underneath the pressure cooker and reduce flame to medium-low. Cook for 50 minutes. Remove from the flame and allow the pressure to come down. Remove the cover and let sit for a few minutes before placing in a serving bowl. Enjoy!